Claude Monet’s “Mill at Limetz” is tonight’s Art Moment. In this work, the mill of the picture's title is at far right, but half of the composition is devoted to the overhanging trees above the river Epte near the artist's home at Giverny in northern France. Monet creates a dense and near-abstract mosaic of paint with flecks of light and dark green, blue and pink. This picture exemplifies Monet's meticulous and thickly encrusted paint surfaces of the 1880s. This new approach may have been a response to the artists Georges Seurat and Paul Signac, who developed their highly detailed, or pointillist, style in the 1880s. one of the main artists represented in "Painting the Modern Garden" at the Cleveland Museum of Art, and Claude Monet is also in the National Gallery of Canada since today with "Monet: A Bridge to Modernity". This is one of two views of the Île aux Fleurs, an island in the Seine near Vétheuil, that Claude Monet painted in the summer of 1880. The other, slightly larger version is in the National Gallery of Art. It’s a Monet type of day. Come see any of the four Monet paintings currently on view, including the Bass collection's "The Gare Saint-Lazare, Exterior View,” left on loan in the Kahn Building’s north gallery. Let’s turn Facebook green in honor of St. Patrick’s Day! Share your favorite work of art featuring the color green in the comments below. In this 1907 painting 'Water-Lilies, Setting Sun' French Impressionist artist Claude Monet beautifully captured light shimmering on the surface of the pond, and the reflection of a weeping willow over which water-lilies float. Monet, the Ultimate Impressionist by Sylvie Patin 的台灣版本:《莫內:補捉光與色彩的瞬間》台北:時報1995 雖然譯者是中國的 有些用詞不容易懂:"馬拉美夫人受了氣"...此書還是很好的入門書: 中文的副標題可能出自莫伯桑的傳記之說法.英文版書名的 Ultimate雙關: 一指他是印象派最後的大師. 又指其品質很好. In 1874 Claude Monet's Impression, Sunrisecaused uproar among the critics and a revolution in painting. His inventiveness was inexhaustible: with the Haystacks, Poplars and, finally, the enchanting Water-lilies of Giverny, Monet captured light in all its fleeting qualities. Though I know very little about it, art has intrigued me for the past few years and impressionism, in particular, has really captured my interest. So, as I have a few months to go until my next university course kicks off, now seems like the perfect time to begin learning a little more about this form of creative expression. After recently taking an audio tour around the National Gallery and finding myself admiring Monet's work more than most others, this book caught my eye in the giftshop. Unlike many art books that I've seen, this one, published by Thames and Hudson, comes as a compact paperback, making it easy to lug around outside the house without being too much of a nuisance. 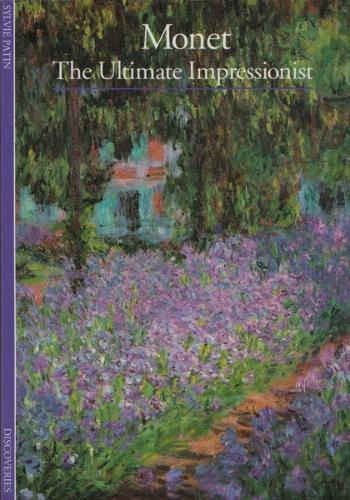 It's filled with full colour images and plenty of commentary, tracing Monet's life through various sources of direct evidence including the art, various letters, and a transaction log book kept by the artist himself. Though the book is relatively short (175 pages, many of which are illustrated), there is a wealth of information about Monet's life and everything is unveiled in chronological order. I can't share everything that fascinated me (I would probably end up listing everything in the book! ), but here are a few tidbits. It was enlightening to find out how much Monet struggled during his career. He was frequently rejected by exhibition organisers, critics often mocked his work, and he was forced to sell his paintings for prices lower than their worth just to have money to live on. He formed very deep friendships and support systems with fellow impressionists such as Manet, Renoir, and Pissarro. He even appealed to Manet for monetary loans quite frequently, and of course he obliged, though Monet always paid him back. Vincent Van Gogh's brother, Théo, even bought some of Monet's work and had them exhibited. I also think my understanding of how to read a painting has improved. From what I gather, the most important thing to observe is the composition, for example the lighting, shadows, and the use of colour. But all you art lovers in-the-know can tell me if I’m right or wrong there! Still, the book wasn't perfect. The compact size compromises the quality of the prints, and so it makes it slightly more difficult to appreciate what the author is trying to convey. Also, the pages are cluttered with information. There are notes explaining each of the illustrations alongside the more detailed main paragraphs, where perhaps readers might just benefit from the name of the piece and a reference to a footnote at the back of the book. Altogether, though, I found this a very informative and enjoyable read. If you're looking for a good pocket-sized book to learn more about Monet, then this would be a good choice. However, if you'd prefer to something with more high quality prints, I would suggest something published by Taschen. I have several art books by Taschen, and though I haven't read them in great detail, they can be very affordable options (an A3 hardcover can be as little as £8.99, while this Thames and Hudson A5 paperback was £7.95). The Maine farmhouse made famous by Andrew Wyeth in "Christina's World" is open to visitors for wandering and wondering. A new hotel has made it easier to avoid crowds at the artist's home and gardens in Giverny, a short trip from Paris. World's most artistic garden? Claude Monet, one of the founders of the French Impressionist painting movement, bought a house and land in the village of Giverny in 1890 and set about establishing the gardens that were to provide inspiration for his art. While the Orangerie museum was rebuilt around them for six years, Monet's waterlily paintings, too large to move, had to remain in place in the oval rooms built for them in 1927. PARIS, May 14 — Over the last six years, as the Musée de l'Orangerie underwent a $36 million renovation and expansion, its most valued treasure, the eight tranquil paintings of Monet's large-format waterlily series, remained trapped inside a noisy and muddy building site. The waterlilies at the Orangerie are some of Monet's most abstract. There was no alternative. While the museum's Walter-Guillaume collection of Impressionist paintings traveled the world, the waterlilies could not be detached from the walls where they were installed in 1927, one year after Monet's death. Construction — and demolition — had to take place around them. With the work completed this month, curators were at last able to relax: the "Nymphéas," as the paintings are known here, emerged no worse for the wear. And on Wednesday, a good four years behind schedule, this museum on the western edge of the Tuileries gardens reopens to the public. At first glance, the Orangerie, standing across from the Musée du Jeu de Paume, its near-identical twin, looks largely unchanged. Yet, not for the first time, it has undergone a radical makeover, notably the addition of underground galleries for the Walter-Guillaume collection. Built in 1852 to house an orange grove, with a glass facade facing south across the Seine, the Orangerie was used to billet soldiers on leave from the trenches during World War I. After the armistice of Nov. 11, 1918, the French prime minister, Georges Clemenceau, invited his friend Claude Monet to display his large-format nymphéas there. Monet had been working on them since 1914 in a spacious studio added onto his Normandy home in Giverny. And he would continue painting these vast canvases until his death at 86. The following year, 1927, eight were finally installed in two specially designed oval-shaped rooms in the Orangerie. 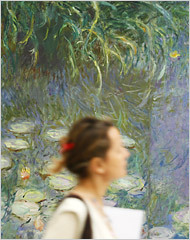 Waterlilies dominated the last 30 years of Monet's life. "These landscapes of water and reflection have become an obsession for me," he wrote to a friend in 1909. "It is beyond my strength as an old man, and yet I want to render what I feel." In total, he painted some 250 oils of the vegetation in and around the Japanese-style lagoon at Giverny. They are to be found in major museums around the world, as well as at the Musée d'Orsay and, prominently, at the Musée Marmottan-Monet, both in Paris. Yet the Orangerie series is unique, not least because of its size: each painting is two meters, or six and a half feet, tall. If lined up side by side, the works would measure 91 meters, or 298.5 feet, in width. They are also conceived so that the four in one gallery represent sunrise, and the four in the other evoke dusk. Most striking, though, is how these paintings, particularly those of dusk, come close to abstraction: it is as if this master of Impressionism had chosen to leap beyond post-Impressionism, Fauvism, Cubism and other new movements and prepare the way forJackson Pollock and Mark Rothko more than two decades later. After World War II, Monet was himself somewhat out of vogue. And in the 1960's, when Juliette Walter sold the collection of her first husband, Paul Guillaume, to the French state, no one thought it odd to alter the Orangerie to accommodate those 144 paintings. Twice married and twice widowed, Mrs. Walter also named the collection after her second husband, Jean Walter. It was at this point that the 328-foot-long rectangular Orangerie was given a second floor, one that blocked the natural lighting intended for the nymphéas. For a while, at least, the newly arrived works by Renoir, Cézanne, Picasso, Matisse, Modigliani, André Derain and Chaim Soutine became the stars of the museum. Today, however, with Monet one of the art world's biggest draws, the new renovation was aimed at restoring the museum to the way he had imagined it. The second floor was demolished so that once again the nymphéas enjoy natural light, which, with the changing weather, seasons and hours of the day, constantly alters their mood. Mr. Brochet, the architect, said unexpected problems arose because, despite the Orangerie's elegant neo-Classical exterior, it was in fact constructed shoddily. "It was thrown up quickly, without proper foundations," he said. "I have just been in Shanghai. They would have torn it down and rebuilt it properly. But that would not be possible here." A fresh complication was posed by the discovery of remnants of a 16th-century city wall in the area assigned to the new Walter-Guillaume galleries. This led to a prolonged bureaucratic squabble over how the wall should be treated: in the end, a 30-foot section has been preserved and is now incorporated into the design. In these new galleries, natural light floods a wide corridor where oils by Renoir and Cézanne are given pride of place. Other rooms are devoted to more modern masters like Picasso and Matisse. The museum's collection of works by Soutine is arguably the best in Paris. Still, for all the extra space gained, what perhaps matters most is that the Orangerie is once again a shrine to Monet and his beloved waterlilies: anyone lucky enough to be alone with the nymphéas is invited to meditate, perchance to dream. Un "instant de plénitude" offert par le Musée de l'Orangerie avec les Nymphéas de Claude Monet.